However, all of these aspects reflect what happens whilst you are alive and are able to care for the child for whom you are responsible. Unpleasant as it may seem, have you stopped to wonder what would happen to your child if you were no longer able to care for and look after them - either because you were too ill or infirm to do so or in the event of your death? One of the most important steps you can take is making a Will in which you can make provision for any children for whom you are responsible. 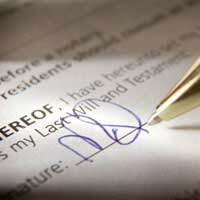 If you die without making a Will then you are said to have died intestate and the law will make certain assumptions as to how your estate is to be dealt with. Those assumptions may not accord with your wishes. Under the rules of intestacy there is an order of priority for those who will benefit. This depends upon whether or not you are married, whether you have children and whether your parents or other relatives are still living. In addition, the amount which each person receives will be determined by how much your estate is worth. If, therefore, you are married or in a civil partnership but want to leave the bulk of your estate to your children you will find that under the laws of intestacy your wishes will be thwarted. The law provides that your spouse/civil partner will receive your personal items (e.g. household items, jewellery etc. ), the first £250,000 of your estate and a life interest in half of the remainder of the estate. Your children, on the other hand, will only get half of the remainder of the estate outright (when they reach 18 or marrying before that) and the other half of the remainder after the death of your spouse/civil partner. If your main asset is the matrimonial home and you do not have much in the way of non-jointly owned property, then your children may not inherit anything. The chances are that if you and your spouse/civil partner are separated, then this will not be what you would want to happen. Similar problems can occur if you have step children. Even if you are married to the parent of a child, or in a registered civil partnership, unless you have formally adopted them your step children will not benefit under the intestacy. Instead, either your estate will be divided between your spouse/civil partner and any of your own children or, if you have no children of your own, then personal items, the first £450,000 and half of any excess over £450,000 will go to your spouse/civil partner outright but the remainder of will go either to your parents or siblings. A further complication can arise if you have remarried. Unless you make a will expressly in contemplation of marriage then, as soon as you remarry any Will in force at that date will cease to have effect and, unless you remake the Will, you will be deemed to have died intestate. This means that any children by a former marriage may, depending upon the size of your estate, fail to benefit at all. This will particularly be the case if your main asset is the matrimonial home and that is owned jointly with your new spouse/partner because the value will not form part of your estate and it is only any other non-joint property that will be taken into account when calculating who gets what upon the intestacy.Making or changing a Will need not be difficult or expensive. Using Your-Will.com from Richard Nelson LLP you can make an online Will for as little as £85 (including VAT) and what is more, you can complete it from the comfort of your own home. They will check through the questions you have provided and will can either be posted or downloaded for you to sign. Bear in mind that if you don't appoint a guardian and your children are left without a parent before they reach the age of 18, then the courts will appoint guardians. However, they will not necessarily be the people whom you would have chosen and there may be a period, pending the appointment, when your children have to be taken into care. By making an appointment in your Will you can take steps to help ensure that the people whom you choose and, possibly just as importantly whom your children would choose, are appointed as guardians. The role of a guardian is to be responsible for your children in the event that they are orphaned before reaching the age of 18 and to attend to their day to day care, welfare, upbringing and education. The guardian can also be appointed to act as the trustee for your children and to be responsible for their finances until they reach the age of 18. For example, you may have been able to leave your children a substantial sum under your Will to pay for their upbringing and education which will be held on trust for them until they reach the age of 18. If you do make a guardian a trustee also, then it would be wise to appoint another, independent trustee, for example a solicitor, to prevent problems from arising if there is a disagreement between the child and the guardian as to what the child needs and also to guard against fraud or misappropriation of the funds. Do bear in mind, however, that if you do not currently have parental responsibility for a child (for example you live with or are married to, or in a civil partnership with, the child's parent but have not adopted or taken on parental responsibility) you cannot appoint a person to be a guardian and, if you wish to continue to be responsible for the child, then you will need to be appointed as the child's guardian in your partner's Will. Problems may also arise for your children in the event that you are no longer able to make decisions yourself. This may arise as the result of an illness or from an accident. The best way to make provision is to make what is called a lasting power of attorney which enables you to appoint another person or persons (an attorney) to make decisions on your behalf in the event that you are no longer able to do so because, for example, you have lost the mental capacity to do so. If you do not have a Lasting Power of Attorney, then the only other way in which your financial affairs can be looked after is if someone close to you applies to the Court of Protection ? a process which can take a significant amount of time and which could potentially costs many hundreds of pounds to pursue. The delays alone could seriously damage how you are looked after and how your financial affairs are managed and you may even find that your affairs are being dealt with by a court official. Provided that they are aged 18 or over and not a bankrupt at the time the form is signed, you can choose almost anyone to act as your attorney. If you wish, you can appoint more than one person to act at the same time or you can appoint replacement attorneys who will act only if the first appointment does not happen. You can even choose whether multiple attorneys should act together or together and independently and can even specify that they must act together for some decisions but independently for others. As with our online Will service, you can make a lasting power of attorney online at our Your-will.com web site. This is a straightforward process and can be done from home. Once you have completed the appropriate questionnaire we will check through the documentation and either post the document to you for you to sign or you can download it through the system, print it off yourself and then sign it. This was a guest blog written by Duncan Finlyson, a partner at the specialist will solicitors, Your-Will.com, which is part of Richard Nelson LLP. Using their online software you simply answer a series of questions and leave the rest to them. As your ex also has parental responsibility, she is entirely within her rights to appoint who she feels she wishes to look after your child. There is no pre-requisite that your daughter has to come directly to you. She is making decisions regarding what she thinks is in the best interests of your child. Your only option is to discuss this rationally with your ex (if you can), and/or offer help and support. As specified, your mother would have to write this in to her will. It is highly unlikely, the courts would remove your sibling from your care if there was such a provision in your mother's will. I can't really give you any more information, except to say if your father challenged the will, then he would have to take the matter to court. The court would always decide what it deems best for your siblings and consistency, stability and the least amount of disruption is considered most important, meaning it would be unlikely to move your sibling from the home to live with a parent they never see. I have a child with my ex partner..his live in g/f I have all the problems with. We do not get along as she has no children of her own and trys to act like my sons mother infront of me. As a result I do not want to be in contact with her..I dont mind what they do as a family hols etc but as we dont get along I dont want her to attend anything I attend with my child. She has started to attend my boys comp that he has once a mth resulting in a huge row..saying she will come to every event..I am extremly mad..do I have any rights? Hi, I am married & am living with advanced cancer. Our home is purely in my husband's name, however I obviously at the moment have family rights to the house as I'm married. I've put a lot into the home myself financially, however I'm worried that should anything happen to me & he remarries that half of my contribution would go to his new spouse & not our daughter. Is there anything I can do to make sure my daughter is entitled to something or is looked after/protected financially should I pass on? If I have 2kids 2 dad's n I due can I do anything to keep them together? I've children with my fiancé, however should anything happen to me before we marry, what would happen to my children. Would they automatically continue to live with him, he has PR.I don't have a WILL as yet. Could i name him to keep our children in a WILL and also could appoint a guardian, should anything happen to us both. Thank you. Hi my brother died leaving a fortune I would like to know if my birth father who left my mother when we where baby's he has never had parental responsibility he has never put a drop of food in our mouths he has had no involvement at all for over 45 years he left my mother to bring us up on her own ,he left my mother and married another woman and brought her children up and yes he left her as well he filed for intestate and took all my brothers estate my question is should he be able to claim through intestate if he has never had parental responsibility. @Butchery -If it was agreed between your brother's former partner and his ex then there is no breach. Unless the non-biological mother adopted the child then she isn't under a legal obligation. Plus now he is 16, he can make his own preference on who he chooses to live with. Me and my ex girlfriend have a son aged 5. I have been in his life regularly and also on his birth certificate. She recently passed away. Now her parents are saying my son is to stay with them. What happens now? My ex partner and mother of my two lovely boys have been separated for 5 years .. For the first 3 years things were good, seeing the boys regularly and phoning almost every day. She then entered a new relationship and things actually turned out better for me initially as I then started having them from Thursday to the following Tuesday most weeks, for a period of around a year ( flushes of a new relationship etc ) she even lied regarding having to work and for me to have the children bank holidays, though this transpired she was out at BBQs ! Though again I was more than happy to see them. Then it all changed .. She moved house and schools without telling me and then stopped answering calls and moved into a house with no gardens and fed the children a diet of gamestation TV and takeaways. She has served a non molestation order on me.. Complete fabrication and something I can prove through phone records, witness and character references. And also a child protection order to withhold the boys from me .. Again on fabricated lies. Absolutely incredulous that whilst I've done nothing wrong the outcome is that I do not get to see my children. To top it off her new partner has threatened me with violence twice ( each logged with the constabulary and actioned) Caffcas has been in touch. done the interview and whilst she asked me if I have representation ( I haven't ) I did reply that my defence was to tell the truth and prove that my ex partner and her new chap are the ones with a tenuous grip on the facts. And if there is justice in this land then right and truth will prevail... What a sad world we live in to see a 'Mum' ( no true 'Mum' would use their children as a pawn to enact some vengeful vexatious rhetoric whereby the victim is often the children in all this, shameful behaviour ) As an adult I understand what she is doing, but what she is doing to my children I will never forgive her or call her a positive attribute to myboys welfare. Sad. I am the biological father to two girls aged 17 and 14,I am separated from their mother,and have been for several years. I have maintained contact with my daughters, they have spent every weekend with me since our separation, We have an amicable relationship, their mother and myself. the girl were both born before 2003. Now, the question I have is as follows, Their mother has just been diagnosed with cancer, of the lung,liver and hip and is about to start radiotherapy. I would like to know two things, How do I/we go about making me legal guardian for the the younger child. On or before her death. We were never married, but did live together as common-law partners. I am very sorry to hear this. You do not say whether you have PR or not. If your daughter was born before 1st December 2003, and you were not married to the mother at the time of your daughter's birth, you will not automatically have parental responsibility, even if your appears on the birth certificate. Paternal parental responsibility can be acquired by making a parental responsibility agreement with the mother, obtaining a parental responsibility order from the court, obtaining a residence order from the court; or becoming the child’s guardian on the mother’s death. You could also arrange this through mediation and this would be then verified by the courts. The matter can also be dealt with in your ex's will. If your ex agrees to appoint you as a guardian then her last will and testament should reflect this. She must include in as much detail as she can, the reasons why she wishes you to take on the role of caring for your children. It is important to ensure that she clarifies your reasons for making this choice so that there can be no confusion over her mental and emotional state at the time of making her will. I hope this helps. I dont want to sound spiteful, but the father of my child doesnt seem too interested in the child. Has done nothing but upset me and stress me to the point its damaging the health of the baby, which he knows. My question is if I die in childbirth (theres been complications) will he get the baby? I want to leave the baby if it survives and I dont to my mother, but I dont want her to be caught in any legal battles. I understand he has rights to see his child, but he knows nothing about children and is a very irresponsible person. He has no intention of financially supporting it. He will throw the odd bit here and there but thats it. Hes done nothing but make things worse and im so worried he could end up taking my baby away and not looking after it. Then again keep in mind I have no proof he wont look after it, hes manipulative and tells a good story. I want to make a will now that the docs are worried ill go into early labour.but is there any point if hes going to be the big man and take my baby? Keep in mind my mum has reared seven kids and has been with me throughout this pregnancy and he lives with his parents and contributes nothing and still ends up woth no money at the end of the month. Hes so obviously not full time dad material but I may not be around to proove that.Grateful for any and all advice ! As specified in the article, you would need to make a Will and use it to appoint a guardian of your child in the event that anything should happen to you before they reach the age of 18. The court will take your wishes seriously. However, I'm sure your childbirth will be fine and that you will be in the good hands of the UK doctors and nurses. I dont want to sound spiteful, but the father of my child doesnt seem too interested in the child. Has done nothing but upset me and stress me to the point its damaging the health of the baby, which he knows. My question is if i die in childbirth (theres been complications) will he get the baby? I want to leave the baby if it survives and i dont to my mother, but i dont want her to be caught in any legal battles. I understand he has rights to see his child, but he knows nothing about children and is a very irresponsible person. He has no intention of financially supporting it. He will throw the odd bit here and there but thats it. Hes done nothing but make things worse and im so worried he could end up taking my baby away and not looking after it. Then again keep in mind i have no proof he wont look after it, hes manipulative and tells a good story. I want to make a will now that the docs are worried ill go into early labour.but is there any point if hes going to be the big man and take my baby? Keep in mind my mum has reared seven kids and has been with me throughout this pregnancy and he lives with his parents and contributes nothing and still ends up woth no money at the end of the month. Hes so obviously not full time dad material but i may not be around to proove that. Grateful for any and all advice ! Hello there, I have a quick question regarding appointing a guardian after a divorce. My ex-husband asked my sister to be the guardian of my 8 year old (but he hasn't even consulted me before asking!) in case he/we both die? Is he legally allowed to appoint a guardian without my consent? Does parental responsibility not automatically fall to me if he dies? Even though we are divorced? I don't mind his brother being guardian in case we both die but I just want to clear the above point first, thanks. If I die, what steps do I have to take to ensure my children are to be raised by my fiance? He is the only one I trust to take care of them. If we are married by then, will they automatically be in his care? None of my children are his and im worried that my ex husband which is very abusive and has never been in their life will try to take them. What do I need to do now while im still alive? You would have to make this provision of guardianship in your Will, as discussed in the article. He could also apply for Parental Responsibility of your children, please see link here. I hope this helps. I am sorry to hear this. It depends whether your mother left a Will and whether she left you a provision in the Will.If you don't want to approach your step-father, are there any other relatives you could speak to who may know? As specified in the article problems can arise if your mother remarried and did 'not' make a Will, as it would means that you as a child by a former marriage may, depending upon the size of her estate, fail to benefit at all. Hi my daughter is only one but even though I live with her dad but we are not together he's never really around and doesn't know much about her but my mum sees her all the time and babysits and they have such a great bond. I would want my mum to be her guardian if anything happened to me as my mum is most like me out of anyone. Should I make a will? Need advice please. Yes, as specified in the article, another benefit of making a Will is that you can use it to appoint guardians of your children in the event that anything should happen to you before they reach the age of 18. Unless it was contested, then the Will and guardianship would stand. Even if it was contested, the liklihood would be that the court would adhere to your requests, if it could be proved it was in your child's best interests.